Saskia teaches on both the onsite and distance-learning programmes – primarily for the Master programme Sustainable Food and Natural Resources. Saskia completed her PGCE in 2003 and worked in environmental education and Forest Schools before studying for her PhD in Soils and Environmental Science with Bangor University. Following this she taught both at CAT on the MSc for Advanced Architecture, Energy and Environment and on various undergraduate and Masters programmes and coordinated their MSc in Sustainable and Efficient Food Production in Bangor. She also worked as a consultant researcher for the Wales Environment Research Hub where she co-authored the Wales Chapter for the UK National Ecosystem Assessment. 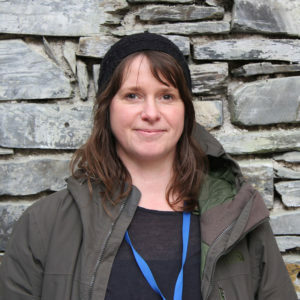 Saskia went on to manage the national Climate Change Consortium of Wales (C3W) programme (2010 – 2015) which aimed to foster greater multidisciplinary working between researchers from across Wales in the field of climate change, along with a primary objective to effectively communicate the evidence-base in society. C3W delivered a broad range of UK-wide educational, policy and business-related initiatives, such as UK and Welsh Government science-into-policy events on specific grand challenges in relation to climate change. In 2015 Saskia and colleagues updated the content of the Atmosphere Gallery in the Science Museum London following the publication of the reports from the 5th Assessment of the Intergovernmental Panel on Climate Change. Saskia continues to works closely at the interface between researchers and society, ensuring knowledge is maximised to improve the lives of non-academic beneficiaries. 2009 Post Graduate Certificate of HE training, Bangor University. Saskia teaches lectures and practicals for both on-site and distance-learning students, particularly for the MSc Sustainable Food and Natural Resources. Russel, S., Pagella, S.L., et al (2011) Status and Changes in the UK’s Ecosystems and their Services to Society: Wales in the UK National Ecosystem Assessment. UNEP-WCMC Cambridge.